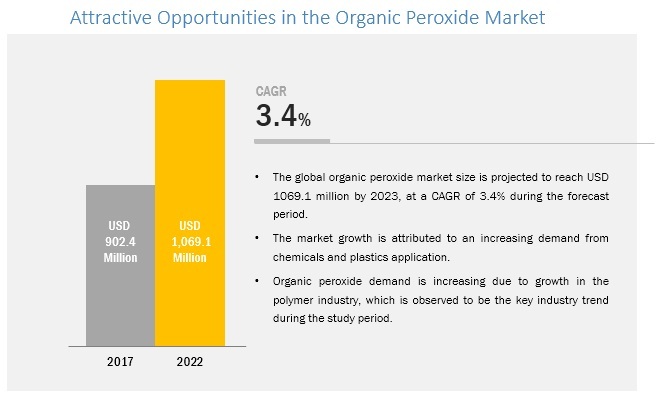 [136 Pages Report] Organic Peroxide Market size was valued at USD 868.0 Million in 2016 and is projected to reach USD 1,069.1 Million by 2022, at a CAGR of 3.4% between 2017 and 2022. The base year considered for the study is 2016, while the forecast period is from 2017 to 2022. 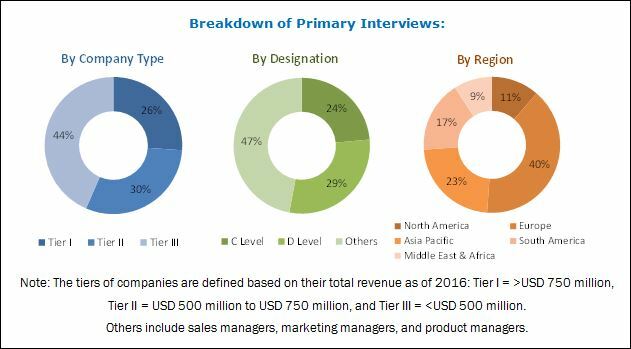 Both top-down and bottom-up approaches have been used to estimate and validate the size of the global organic peroxide market, and to determine the sizes of various other dependent submarkets. The research study involved extensive use of secondary sources, directories, and databases, such as Hoovers, Bloomberg, Chemical Weekly, Factiva, and other government and private websites to identify and collect information useful for a technical, market-oriented, and commercial study of the global organic peroxide market. Some of the major players in the organic peroxide market include Akzo Nobel N.V., Arkema, United Initiators, Pergan GmbH, NOF Corporation, Novichem, Chinasun Specialty Chemicals Co., Ltd, MPI Chemie B.V., Akpa Kimya Ambalaj Sanayi Ticaret Ltd., and Vanderbilts Chemicals LLC. This research report categorizes the global organic peroxide market based on type, application, and region. The global organic peroxide market is estimated at USD 902.4 Million in 2017 and is expected to reach USD 1,069.1 Million by 2022, at a CAGR of 3.4% from 2017 to 2022. 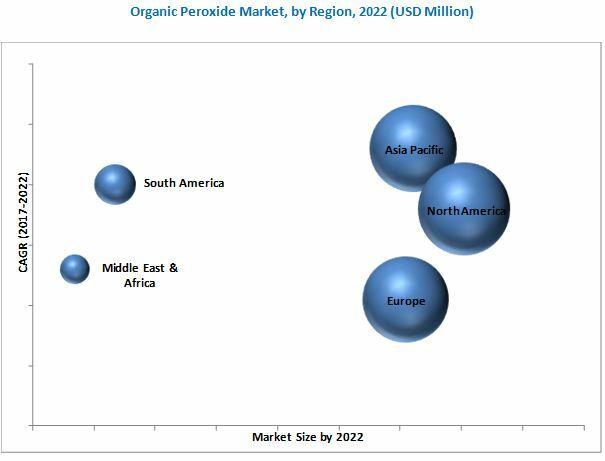 The growth of the organic peroxide market is driven by the increasing demand for organic peroxide from various end-use industries, such as construction, automotive, composites, and electrical & electronics. The diacyl peroxide type segment is projected to be the largest type segment of the organic peroxide market during the forecast period. Diacyl peroxide is used as a free radical initiator in the polymerization process and for the polymerization of PVC. It also acts as an initiator for vinyl monomer polymerization. Furthermore, it is used as a curing agent for thermoset resins and for cross-linking of thermoplastics and elastomers. Some diacyl peroxides are also used as active pharmaceutical ingredients. The chemicals & plastics segment is estimated to be the largest application segment of the organic peroxide market in 2017. Most of the organic peroxides are used as catalysts or intermediates in various chemical reactions. Organic peroxides are also used as initiators, accelerators, curing agents, and as free radicals for the polymerization of LDPE, PVC, and plastics. The coatings, adhesives & elastomers segment is expected to witness the highest growth during the forecast period. The growth of this segment can be attributed to the increasing infrastructural development and building activities in emerging countries. North America is estimated to be the largest market for organic peroxide in terms of value in 2016. The growth of the market can be attributed to the increasing demand from industries, such as electrical & electronics and automotive in the region. Asia Pacific is expected to be the fastest-growing market for organic peroxide. The growth of the market in the region can be attributed to the rising demand for organic peroxides in emerging countries such as China and India. Organic peroxides are considered as severe fire and explosion hazards. Peroxides are chemically unstable and can easily decompose, releasing heat at high temperatures. The vapors released by peroxides are flammable. Due to these properties, organic peroxides are transported in smaller quantities. This may act as a restraint for the growth of the organic peroxide market. Companies have adopted strategies such as mergers & acquisitions, expansions, and joint ventures to enhance their market shares and widen their distribution networks in the organic peroxide market. Companies such as Akzo Nobel N.V., Arkema, United Initiators, and Pergan GmbH adopted these strategies. For instance, Akzo Nobel N.V., in May 2017, planned to increase its organic peroxide capacity at its polymer chemistry production facility in Los Reyes, Mexico. The expansion will increase the company’s peroxyester production capacity by 40%. With this expansion, the company aims to serve the increasing demand from its customers in the polymer industry. Arkema announced the construction of a new organic peroxide plant at Changshu site, China. This expansion doubled the production capacity at the site. The expansion was aimed at catering to the high demand for organic peroxides in Asia. 10.7 Chinasun Speciality Chemicals Co., Ltd.
10.11.1 Kawaguchi Chemical Co., Ltd.
10.11.2 Suzhou Hualun Chemical Co., Ltd.
10.11.3 Jiangsu Yuanyang Pharmaceutical Co., Ltd.
10.11.4 Dongying Haijing Chemical Co., Ltd.
10.11.8 Plasti Pigments Pvt. Ltd.